Odd fruits streak continues... after the mustached pear of La Belle Helene, let me introduce you to the sweaty peach of Le Mimosa. The only reason why I decided to talk about the latter is because I am puzzled by an unexpected body odor-ish quality to the composition. Cumin often has that "skin warmth" feel about it, but does anise? In any case, there is something warm and human if not exactly pleasant about Le Mimosa. Other than that...well, sometimes if you try hard, you can sort of intuit the declared star note(s) in a composition...like cedarwood in Cedre...but however hard I try, I am unable to get any mimosa in Le Mimosa. There is something vaguely rosy about it, with a cooling freshness from anise on top and a lot of plasticy fruitiness from peach throughout, and that's about it. There are several takes on mimosa out there, none particularly realistic, but most fairly successful in representing at least a certain characteristic of the aroma. L'Artisan's Mimosa Pour Moi is all about the watery doughiness of mimosa, Farnesiana focuses on its warm, almondy quality...Goutal's rendition has nothing to justify its name. To be honest, these days I don't want to try hard to understand the whys and how-comes of new releases. I probably have been all puzzled-out in the beginning of my obsession by trying to decipher Lutens's creations. Was the Goutal team going for the mimosa feel rather than the mimosa smell? Perhaps, but if so, they failed anyway. The fragrance does not evoke the vivid, joyful yellow of mimosa. Rather, it appears to be pale, pastel peach in color as well as in smell. Again, were it not for the incongruous sweaty feel, the perfume would have been totally unremarkable. Available wherever Goutal is sold. 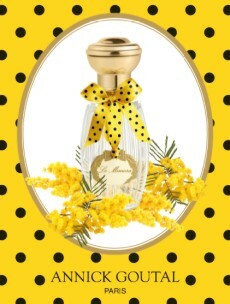 What is your favorite mimosa fragrance? How sad! I have to confess that after a really dedicated sampler of mimosa scents, I still swoon for "Mimosa Pour Moi" (did I get that right?) It's so ethereal and lovable. Change of subject: my word verification capcha is "calumbe." So close to "Columbina!" I had been looking forward to this and a friend likes it, but it seems other reviews have been like yours: not impressed. I don't know what true Mediterranean mimosa smells like, but in addition to Farnesiana & Givenchy Amarige Harvest Mimosa, I really love SMN Gaggia, which I will definitely be buying for this summer. I may also pick up a bottle of L'Occitane Mimosa Esterel, which I found really pleasant on a recent sniffing spree. Oh I need to try Gaggia! Maybe you will have more luck with it? "Mustached pear." Wow, that is the best description of La Belle Helene that I have seen. I was really disappointed by my sample after all the hype in the blogs. I have a feeling that I would be similarly disappointed by Le Mimosa. I think I will give it a pass. I can probably pass on this one, too. It's kind of nice to not have any lemmings lately! Don't pass on it, you just never know! My favorite mimosas are L'Occitane Mimosa Estrel and L'Artisan Mimosa pour Moi. I am trying to decide between the two. I haven't tried Mimosa Estrel, and clearly need to! Plastic-y peach doesn't sound good. I'm very happy with L'Artisan's rendition, which a kind friend introduced me to. It's one of my favorites for Spring. I've never smelled "real" mimosa so I'm happy to accept L'Artisan's as the benchmark. Mimosa is more or less a symbol of spring in Russia. I miss it. got to try this at neiman's yesterday, and it was just so not what i was hoping for, and very much as you describe. such a disappointment - i would've thought this house would've nailed mimosa quite nicely. oh, well.